Special thanks to Udon for sending me this advance copy of Sengoku Basara Samurai Heroes: Official Complete Works. Sengoku Basara Samurai Heroes is also known as Sengoku Basara 3 in Japan. 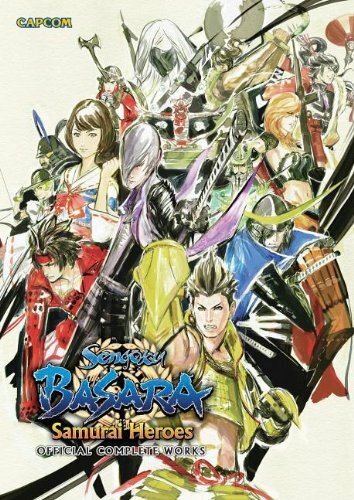 This is the English translated edition of the original Japanese title 戦国BASARA3オフィシャルコンプリートワークス that was released in October 2010. Udon has skipped the earlier artbooks and translated this first. This is a character design book since the game is all about characters. It's a 152-page paperback. The book starts with a few splash pages in the same art style as earlier artbooks. It's a brush painted look but I can't really confirm they aren't digital paintings. The style is very different compared to other video game art books. Character designs are split into two parts. The first part collects the sketches and coloured illustrations. There are 11 characters with a few pages each. Commentary is in the form of a one paragraph character profile. The second part features the CG art which are the 3D rendered character models. More than 30 characters are included. It's interesting to see character designer Makoto Tsuchihayashi's come up with costume designs for the Sengoku period (Warring States Era). It's a good mix of armor and cloth to give characters the agility to move. The designs are varied and unique, with Asian influence. Looking at all the different costumes, it feels like every warrior is fighting for himself, which probably suits the game. The other artworks are storyboards of selected scenes, and art for promotional merchandise. There are no environment paintings, strangely. The last part of the book are interviews with the Japanese voice actors, singers T.M. Revolution and Chiaki Iskikawa, and the creators producer Hiroyuki Kobayashi and director Makoto Yamamoto. Just like the previous Sengoku Basara artbooks, this should appeal more to fans of the game.